emerging thought...: A little Bible study on The Book of Revelation and if Jesus is violent of not. Exploring Faith in a Postmodern World. In Revelation, "The Lion and The Lamb" are the same but the thing is it was expected, as it was the first time Jesus appeared, that this Messiah would be a Lion. He was, except this Lion was ALSO, The Lamb. To make Jesus The Lamb and “The Violent Lion” missed the entire point of Revelation. The Unveiling of Jesus is about The Lamb being King of Kings. To use this verse to justify Jesus being violent is actually the opposite it teaches. 3. And no one in heaven or on the earth or under the earth was able to open the scroll, or to look at it. 4. So I wept much, because no one was found worthy to open and read the scroll, or to look at it. 6. And I looked, and behold, in the midst of the throne and of the four living creatures, and in the midst of the elders, stood a Lamb as though it had been slain, having seven horns and seven eyes, which are the seven Spirits of God sent out into all the earth. 7. Then He came and took the scroll out of the right hand of Him who sat on the throne. 14. Then the four living creatures said, "Amen!'' And the twenty-four elders fell down and worshiped Him who lives forever and ever. 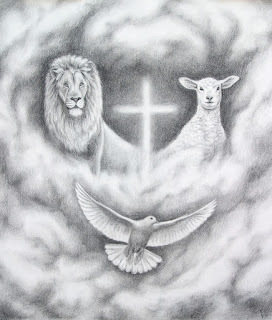 Notice the Lamb is Worthy to sit on the Throne AFTER He was called the Lion of Judah? And later, how did Jesus overcome the devil and evil? Read on… for this is THE KEY that unlocks and reveals Jesus for Who He Is.. Revelation 12:10. Then I heard a loud voice saying in heaven, "Now salvation, and strength, and the kingdom of our God, and the power of His Christ have come, for the accuser of our brethren, who accused them before our God day and night, has been cast down. 11. "And they overcame him by the blood of the Lamb and by the word of their testimony, and they did not love their lives to the death. We overcame not by power of might but by the Blood of the Lamb and our word of testimony… ummm. Nope, you see no guns or violence in this verse. Again, twisting this verse is the OPPOSITE the Book is revealing. To make it a book that justifies war and violence is antichrist. Isaiah 53: 9. And they made His grave with the wicked but with the rich at His death, because He had done no violence, nor was any deceit in His mouth. If you believe in Violent Jesus, you are worshipping a false Jesus. You are not following or believe in the Real Jesus who was non-violent. Before you respond (as opposed to attack), take time to study this out and see I am not pushing a false narrative. Deal with the verses and your OWN theological breakdown of the verses and see your view is simply wrong. These are the unedited versions. New edited versions will be available soon.